the clutch cable may come in contact with the wiring harness which may damage it. and could even lead to the engine turning off. Sounds very similar to the Trophy Ignition Switch wiring problem ! after he initially contacted me by PM. Hopefully when we find a solution this will benefit other Members too ! During the Christmas holidays I changed my zumo with the new tomtomrider 550. In addition, I have mounted 2 LED spotlights one connected to the minus of the 12 volt contact in glove box. The engine is in the garage on the trickle charger from mid November. Now the engine does not start anymore. No fuses have been blown. Lamps burn radio also does it and all other things there are no error messages. an idea what might be going on? HOW TO: Check the most common faults and issues. but if not let me know and I will ask you some more questions ! I think I have to check the connections at the solenoid. Could you let me know where I have to look. Which fairings have to be disconnected? The Starter Solenoid is just forward of the Main Battery. but are a bit fiddly to get at without further dismantling. I dismantled right hand side firings. I found the starter solenoid. Pushed and seem to be connected. OK, First of all - do you have a Test Meter and know how to use it ? any wiring connections etc when installing your new lights and Sat Nav ? and right, if the Starter then starts to spin, this will confirm you have this wiring fault. ( If the Starter still does not spin, the Ignition wiring MAY still be faulty ! ). Is the Engine Kill switch in the RUN ( ) position and operating correctly ? Is Neutral Gear selected AND displayed on the Instrument Panel ? ( A fauty Gear Position Sensor can prevent the engine from being started ). Is the Clutch pulled IN - and the Clutch Switch operating correctly ? Is the Side Stand UP, and the Side Stand Switch Operating Correctly ? Main Battery - What is the Voltage without the Battery Tender connected and Ignition OFF ? It should be somewhere in the region of 12.8 to 13.2 Volts. then it is likely you need a new Battery, and that may be all that is wrong ! What happens with the Ignition switched ON and you press the Starter Button ? Can you hear the Starter Solenoid "clicking" ( in front of the Main Battery ) ? or a Faulty Solenoid, or faulty wiring to the Starter Motor, or a Faulty Starter Motor. available in the official Service Manual. Starter Solenoid - check the smaller Black wire with Spade terminal has a good connection to Ground. Starter Solenoid - check the White wire with red strip has 12V when the Starter Button is pressed. Check the Integrity of Fuse No.5 ( 15A ) which is for the Ignition and feeds the Ignition Relay. it is the one on the left as you look at them ). Check the operation of the Starter Button, and the Kill Switch. but if not then you may have to resort to having the Trophy recovered to a Dealer and let them fix it. Audio, Sat Nav, and Intercom / DAB Digital Radio (UK ) for the Trophy SE with Forum Discount Offer ! with "DAB" ( Digital Audio Broadcasting ) Radio Stations. for them to look into doing so in the future - due to the Trophy being discontinued. add-on audio modules ( mainly for Cars ), to receive DAB radio via the Car Head Unit. 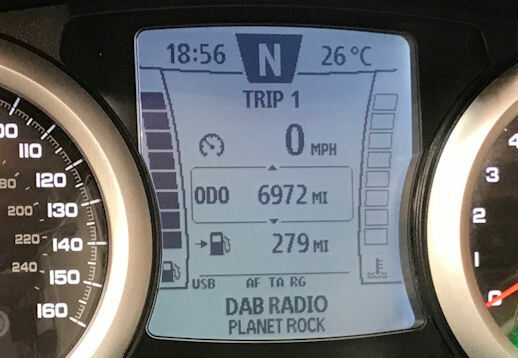 allowing the DAB Radio Stations to be displayed on the Trophy Instrument Panel ! 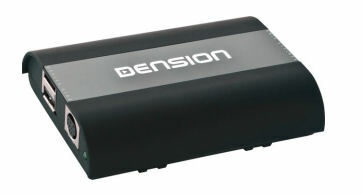 This utilises their Dension DAB+U DAB Radio Receiver. ( Edited 09/01/19 ! ) PLEASE NOTE that a DAB Antenna is also needed. in terms of Signal Reception, as the DAB Radio in my car. I have now found a dedicated DAB Antenna solution - Please see Post Reply #29 & 31 for details ! Dension are able to offer Trophy Forum Members a 20% Discount off the RRP of the DAB+U device until 31/03/19. ( RRP £126.87 reduced to £101.50 with FREE Shipping ! ). To obtain the Discount, you will need a "Voucher Code". and I will send your Code with instructions on how to use it ! ( You can also request your Voucher Code from Forum "Admin" ). The DAB+U device connects to the Trophy Audio System USB Port. DAB Radio Stations are "mimicked" as being MP3 Tracks. the lower line of the Trophy Audio Display will show the name of the Radio Station. The handlebar Audio Switch Cube buttons are used to change Stations, and other Operations. to the Dension DAB+U device must be carried out by the User before first use. for downloading the required Configuration file and uploading it to the DAB+U device. I purchased the Dension DAB+U device and decided to locate it inside the Glove Box. and is a relatively short distance for the Antenna and Power connections ). Antenna and Power supplies are available, then utilise an alternative Antenna Solution mounted elsewhere ). for a recommended dedicated DAB Antenna solution ! with a new "DAB / FM" Mast. This preserves the reception and selection of FM and AM Radio stations. Solution mentioned in later Posts is much more stable. 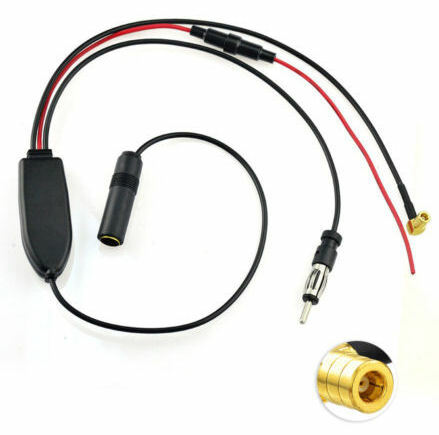 Amplified Antenna Splitter cable with DIN Male, DIN Female, SMB Female, and Power connectors. See Photo - These can be found quite readily on Amazon / eBay etc, usually for around £15.00. SMB Male to SMB Female Right Angled extension cable ( 30cm ). such as during routine maintenance / servicing. Replacement screw in DAB Antenna Mast. there was an unacceptably high number of instances where the Signal was lost. Using a "proper" DAB Antenna Mast has resulted in far fewer "No Signal" reports. DAB On Wheels Spare mast for Kinetic DRA-6001 ( £14.99 ). 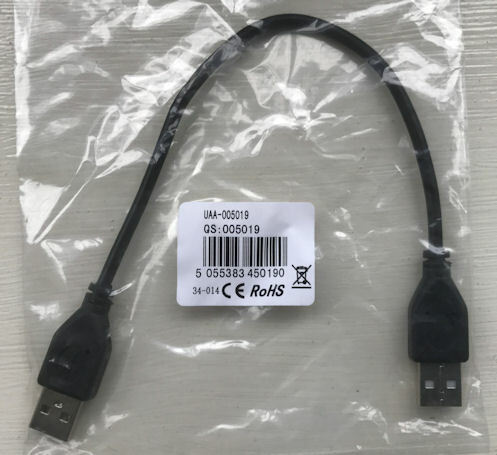 A short ( 25cm ) USB Type A Male to Male cable is needed to connect the DAB+U device to the Trophy USB Port. somewhere other than inside the Glove Box. Remove the Trophy Screen by undoing the six screws. Put the screen somewhere safe to protect it from getting scratched ! Remove the Glove Box, disconnecting the wires for the Accessory Socket, USB Socket, and Lock Solenoid. How To Remove the Fairing ...... Paragraphs 11 to 14.
to access the rear of the Instruments, where there is an in-line connector to the Trophy FM antenna. inside the Mirror Pods - directly above each of the large headed Indicator retaining screws. The Scrivets can be carefully unscrewed - also recover the plastic parts they screw into, to prevent losing them ! 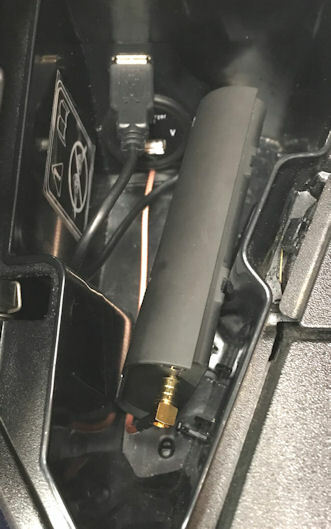 Locate the In-Line Trophy Antenna cable connector that runs through a Clip at the rear of the Instrument Panel. Grasp the connector ( NOT the cable - to reduce the risk of damage ) and pull the connection apart. and the Female DIN Socket of the Amplified Splitter Cable to the Male DIN plug of the Trophy Antenna Fly Lead. Route the SMB Male connector and Power cable across and into the area below the Glove Box. Keep the wiring tidy, routing it so as not become trapped when refitting the Instrument Pack. Prepare the Glove Box to accept entry of the Antenna Fly Lead. from my Trophy and replaced with a combined Voltmeter / USB Power Socket ). inside the socket by depressing them while pushing / pulling the metal part out of the Glove Box. A thin blade or small screwdriver can also be used carefully, to pry the socket apart. so that the Female socket was inside the Glove Box, ready for connection to the DAB+U. Refit the Accessory power socket ( or Voltmeter ). into the Positive Feed to the Glove Box Accessory Socket. ( You may decide or prefer to use an alternative Power Source ). to the SMB Male Plug of the Extension lead emerging from the Glove Box. Reconnect the Glove Box Accessory Socket wiring, USB Port, and Solenoid Lock wiring. to connect the Lower of the two DAB+U USB ports to the Trophy USB socket. Unscrew the Trophy FM Antenna mast and replace it with the new DAB Antenna Mast. Follow the User Guide that and can be downloaded from the Link at the end of this Post. Have the Trophy in a location where there is good DAB Radio reception. unless in a confined space where the exhaust fumes would be hazardous. scroll down to AUDIO OUTPUT, select SPEAKERS, Press "i" then EXIT out of the Menus ). the Dension DAB+U device should be shown as "DBU31.220.5.4." The DAB Radio now needs to Scan for DAB Radio Stations - Refer to the User Guide. When SCANNING has completed the DAB+U will restart and is then ready for use. ">> Next Track" or "<< Previous Track" for the Next or Previous alphabetically stored Radio Stations. Go to the Dension Web Shop and Enter your Voucher Code at the Checkout. Note that you will need to register on their Web Site before you can use the Voucher. Send me ( or "Admin" ) a Private Message to request your Voucher Code ! and become a better, safer rider. ( Other organisations are available ! ). and for a while I stopped riding altogether to save my parents anxiety - as I was now their eldest Son. that I was about to join my Brother ! so I bought one of the last Trophy bikes available. My confidence needed some restoration, and my Riding skills needed improvement ! and I signed up for the Advanced Bike Course - I'm so glad I followed his advice. I was declared "Ready for Test" - and booked the date - Yesterday at 11:00 Hrs. at the best of times, but the examiner had a chat with me and put me at ease. Speed Restrictions, National Speed Limits, through Towns, Villages, Open Roads & "Twisties". and rode what I thought was my best ride ever ! "That was excellent - I'm awarding you a 'F1RST' - Your Brother would be proud of you !" so I'll be spending a lot more time with my new found friends at my local IAM Group. and see what they can offer you ! an Advanced Course - or even just one tip - picked up on your first "Lesson"
to stay safe and become a better rider. Time Out - General Chat / Time Out ! I've compiled a list of the most common issues to be aware of when buying a previously owned Trophy. I have "locked" it - but please feel free to send me a PM with anything I've missed off the list ! ( There may have been no actual Production since 2016 ). 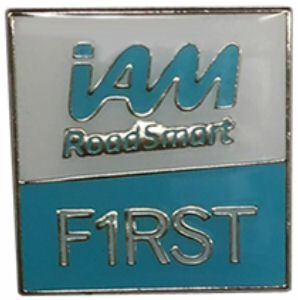 All Trophy models had 2 years unlimited mileage warranty from the date of first registration. There should be 3 ( 2 for the Non SE Model ). Owners Handbook, Service Handbook, and Audio Handbook. These may be found in a storage recess on the underside of the Pillion Seat. ALL US / Canadian Export Models ( But NOT applicable to any other Markets ). Check the Audio Software Version. The first Software release ( Version 1.04A ) had a "bug"
which then required replacement of the Main Battery. but there are many Trophies that have not been updated. where the Cyclinder Head could develop a rattling noise. Triumph didn't issue a "Recall" for this, but did offer a Free of charge "Upgrade"
which involved a modifcation to the Cylinder Head. after which the Modification was already incorporated. so check with a Triumph Dealer that this has been done if it falls withn that VIN Range. Up to December 2013 - There was a Centre Stand Recall to add a strengthening bracket. After that date a modification to the Frame was utilised and the bracket was not needed. and whether the Recall has been carried out. TSB 486 - Gear Change Pedal - reposition. and the engine cutting our or not starting. Check the handlebars for free movement from lock to lock with the Ignition ON. fully to the right. 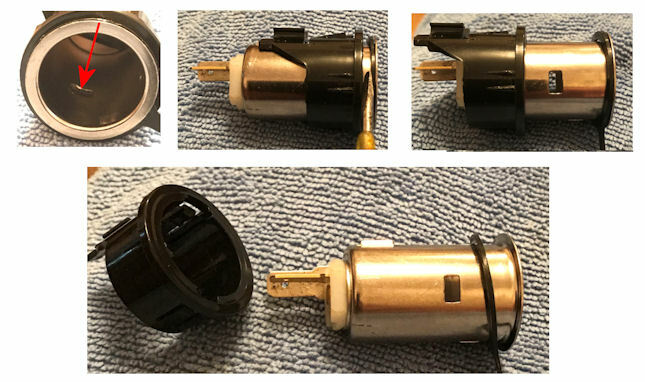 See this Topic for more information : Ignition Switch DIY Repair. These seem to be prone to developing what appears to be Warping of the discs. While the Discs may be warped, this could also be due to the "Bobbins"
though not warped, in such a condition they can exhibit the same "pulsing"
by cleaning and freeing the Bobbins with proprietary Brake Cleaner. Look for peeling or bubbling black paint indicating that the underlying alloy casing is corroding. corrosion of the Radiator, with the Paint covering flaking away. and for any obvious signs of leaks on the shop floor - sometimes attributable to loose hose clamps. sometimes attributable to loose Crankcase bolts. They are scheduled to be stripped down, inspected and lubricated every 20,000 miles, or 2 years. Many Members now carry out this procedure routinely at least every year. ( Also applies to the Rear Brake Pedal Pivot Bolt ). resulting in being unable to change gear, and the broken stud having to be drilled out. Check for smooth and free operation of the Pivot. The same part is used on the Rear Brake Pedal but for some reason this seems far less prone to breaking. Topic here : History of Shifter Lever bolt breaking ? These can be checked for and displayed on the Instrument Panel. because of the switch being there, without having checked they are actually fitted ! 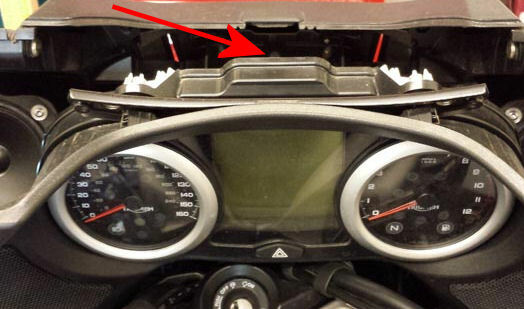 Note that the Heated Grips only heat up when the engine is running. All Trophy SE Models had TPMS as standard equipment from new. The non SE Model had this as an Option. "WARNING - BATTERY LOW FRONT ( or REAR ) TYRE" Message on the Instrument Panel. and the complete sensor would normally need to be replaced. and soldering new batteries in ). so that the nagging Warning Message is not displayed at all. the Pressures only appear in the display after riding for a short distance. or refusing to move UP or DOWN beyond a certain point. The Triumph Top Box is an optional accessory. under the riders seat, or in the Glove Box. 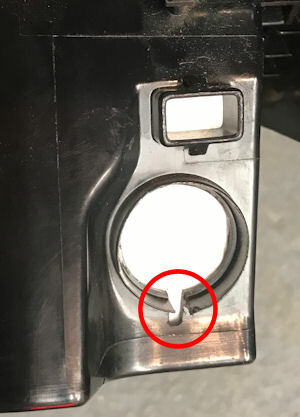 especially if you may get a TopBox at a later date - it will be difficult to get a new Barrel keyed alike. On Two Wheels - Bikers Chat / Triumph think the Touring Market is dead - BMW DON'T ! Tyres and Wheels / Leaky Tyre Valve ! there was a gentle Hissing sound ! A simple matter of tightening the valve up with a Valve Tool cured the problem. How many Members don't have one of these Tools ? to see if it forms an expanding bubble - indicating a leak. I could have been left stranded, so I now carry my Valve Tool on the bike.